Flexible 4x6 photo album features a removable cover and holds twenty four 4x6 pictures. Book-bound style with ribbed spine. Great party favors. Acid free. Preserve your memories using a 4" x 6" MBI Flex Photo Album from Get Smart Products. This compact photo album features a removable front and back cover that allow users to personalize their photo book by adding a photo to the front or back cover or by distinguishing it with a piece of personal artwork. The photo album comes equipped with enough pages to hold up to 24 photographs. Pictures are contained in clear, top-loading pockets that are book-bound with a ribbed spine for superior durability. The pages have a white mesh background to better display and protect photographs. 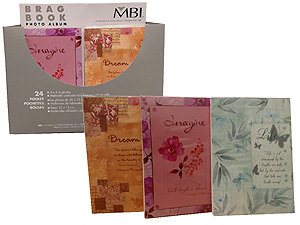 The MBI Flex Photo Album makes a great keepsake, year end student giveaway, party favor or promotion for your next event. This album is shipped in assorted design covers, so the albums you receive may not be what is pictured. The pages of the album are archival quality, acid-free and photo safe. When closed, the photo album measures 4-7/8" x 6-3/8". Albums are sold individually and quantity discounts are available for bulk orders. Shop now to take advantage of our fast shipping and low pricing.